Language Objectives: Learn to use basic adjectives to describe things and also learn to use adverbs of sequence to talk about a process - first, next, then, finally. 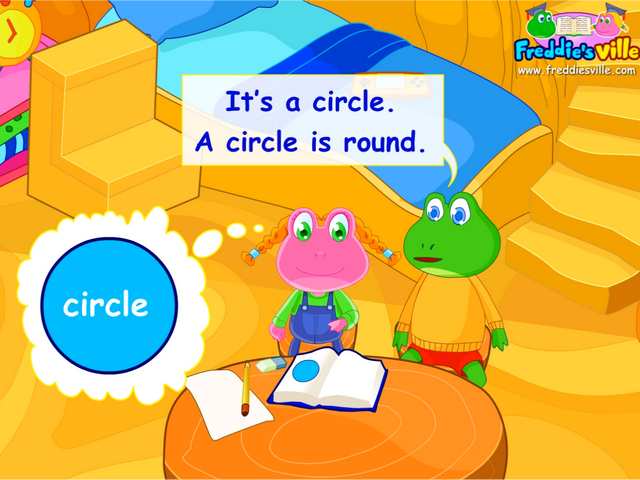 Dialogue Story: Lisa and Freddie are in their room looking at a book about shapes. Lisa asks Freddie to teach her the names of shapes. She wonders what we can do with shapes. Freddie shows her how to draw a clown using shapes of different sizes and color. Grammar: Though not the main focus for low levels, this lesson also introduces adverbs of sequence which is using for describing a process. First draw a big circle.